Active tree falling and hauling on and adjacent to the Erlandsen Forest Service Road (FSR) and should drive with caution. Those visitors accessing the park from the Erlandsen FSR should drive with their headlights on, call their kilometre position on the signed radio frequency, and obey all road safety signage. Sleeping Beauty Mountain Park provides day hiking opportunities. The park has an old forest service trail which offers access to beautiful alpine lakes and impressive alpine hiking overlooking the Terrace area. The trail is 6 km long and has several steep sections. Sleeping Beauty Mountain Park is located northwest of the City of Terrace. To get there, drive west on Highway 16 until you cross the Kitsumkalum River at the city limits. Turn north at the Tempo Gas Station onto the West Kalum Forest Service Road (FSR) follow this road for approximately 9 km before turning left on the Erlandsen FSR where there are signs for Sleeping Beauty Mountain Park. Follow the Erlandsen FSR for approximately 5 km staying on the main branch – there are signs at each junction for Sleeping Beauty Mountain, follow these. It is highly recommended to park at the information shelter for Sleeping Beauty Mountain and walk up the last 1.5 km of access road – it is very narrow and overgrown. A well marked, good trail leaves the access road at the trailhead and climbs steeply through second growth before levelling off quickly and switch backing up through the old growth forest and into the subalpine. History: Sleeping Beauty Mountain Provincial Park was established as a result of the Kalum Land and Resource Management Plan (Skeena Region). Wildlife (specific to this park or area): Sleeping Beauty Mountain Park provides good wildlife viewing opportunities. The park protects habitat for grizzly and black bears, moose, mountain goat, ravens and blue grouse. There is no electronic version available. 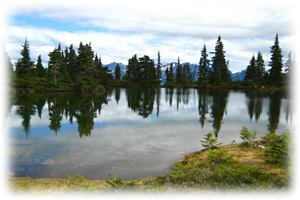 This Park was established as a result of the Kalum Land and Resource Management Plan (Skeena Region). See News Release for more information. Total trail length is 6km. The first section provides moderately difficult hiking through a mature hemlock/fir forest and sub alpine meadow. From the meadow, the trail follows an unmarked ridge through a series of peaks which eventually leads to the top of Sleeping Beauty Mountain. For your own safety and the preservation of the park, obey posted signs and keep to designated trails. Shortcutting trails destroys plant life and soil structure. Wilderness camping is permitted. There is a developed campsite by a small tarn in the alpine with tent pads, a metal bear-proof food storage locker and a pit toilet.